As far as I know you can’t. There’s no GUI for viewing them and they are encrypted and stored in locked down internal memory. If you forgot a password to your account, most online services hav a “I forgot my password” option that will send you a link to reset the password by text or email. I was cleared my browsing history of opera mini of my Android .Can I access my history again anyhow? plz help me ….. If you cleared history it’s gone, there’s no way to get it back. Recovering data lost when you hard reset your phone isn’t possible. Few months back i was surfing facebook with OM 7.1. When i clicked on a video, OM opened a dialogue box to download it. Normally on pc video is streamed not downloaded. Now it doesn’t download video on my OM. What has changed? It depends on whether the video is served as a stream or as a link to a file. Can i open wml wap pages stored in memory card? If you open a wml page on the web and save it with Opera Mini you can open that saved page later using Opera Mini later. If you have some wml code in a file and you copy it to your phone’s memory card, Opera Mini can’t open it. hello i have nokia 206 i want to retrive the saved password in it … is there any way that i can access the config file of opera mini… please help….. Try uninstalling and re-installing Opera Mini and when it asks you if it can connect be sure to say Yes. Opera Mini will show the Speed Dial in grid view if the phone has a 240 x 320 px or larger screen AND at least 4 MB in Java heap memory. There’s no way to overide that rule if your phone doesn’t meet those minimum requirements. how can i copy a download url link? There’s no easy way. You can either open the link and copy the URL from the address field or use server:source and copy it from the source code. i hv downloaded n installed opera mini 5 on my java phone. it installs n loads well but i’m trying to accept the license agrement and nothing is hapenx. is it dt opera 5 n 6 work only with touchscreen phones? On most non-touchscreen phones you need to scroll through the license agreement and then press the left softkey to accept the terms. Opera Mini 5 is really old. Try downloading the current Opera Mini 7.1 version from http://m.opera.com using your phone’s built in browser. No, the Opera server has no way of opening files in your phone’s local filesystem. hei bro…how can i find my saved password from operamini password manager? Not possible as far as I know. Use the password recovery feature on the Website whose password you forgot. Which applecation will mache my small sony ericsson w880i. Hi Dennis, seeing this really made my day cause I never knew they existed. 1) copy the obml files where they are placed in my phone and putting them in another phone running opera mini? 2) copy the obml files into computer and try using opera emulator to open it? 3) copy it out, update my opera and copy them back in to the same folder so that they will appear again in my saved pages? I asked cause I want to change to another phone and have over 300 saved pages I don’t want to lose. Other sites said opening it via emulator works and some said that even after making a backup file which they copied back into the same opera folder before updating, the files never appeared in the saved pages. Or if I bookmark those pages, can I then save them somewhere; maybe a device or server and open them later in ANY device that has opera mini? My opera is 5.1, windows phone. 3. Note down or copy the filename of the saved page. 4. Go into the folder where your old saved pages are and rename one of the files to the name you just copied. 5. Move the old file with the new name into Opera Mini’s Saved Pages folder. You’ll get a message informing you that a file with that name already exists, and it’ll ask if you’d like to replace it. Opera Mini should now read that file and be able to open it. You’ll have to do that for each saved page. If the touchscreen doesn’t work it’s because you are using a generic Java version of Opera Mini or one intended for non-touchscreen BlackBerrys. Go to http://m.opera.com with the BlackBerry browser to get a version of Opera Mini optimized for BlackBerry OS 7 touchscreen phones. Dennis, thanks for your reply. smartphones’ memory card (E drive)? to a saved webpage titled “index.html” stored on the phone? If not, how does my phones’ own browser open the “index.html” file? The phone browser is self contained and can parse html. It can open the file because it lives in the in the same local file system as the index.html file. If you want to read the file offline with Opera Mini, upload it to Dropbox, open the Dropbox copy with Mini and make it a saved page. That will save the file as OBML which is the only format the Opera thin client can read. how do I ENSURE OperaMini 4.2.13337 opens this instead of the phones’ browser? ie. how do I open a LOCAL (offline) file in OperaMini? 2) Sometimes I click on a link in a webpage and THE SAME THING happens. What SAME THING happens when you click a link. opera mini 5 jave.apk this is what i want..
how about downloading a video? If your phone has a memory card and allows 3rd party apps to write to it you should be able to download videos from sites that offer downloadable (not streaming) videos like http://vuclip.com/ When you click a link to a downloadable video file on a device that supports downloading Opera should prompt you to Open or Save it. Click Save to download. If you mean export either and no way to view passwords. Which vision is best for my nokia 3110c?. Opera recommends Opera Mini 4.4 for the Nokia 3110c. There’s no Opera Mini 8, latest is 7.5 for Android. If your Opera Mini is asking for a registration code it’s a fake. Go to http://m.opera.com with your phone’s built-in browser to download the real thing. The commands are very helpful but how can we cleare the cache? My opera mini was 432kb in my nokia 5130c when installed but now it is 485kb. Why it increase 5 to 7 kb daily? There’s no way for the user to clear the cache. It’s supposed to be cleared when you exit the browser. The size increase maybe due to browsing history (which you can clear on the history screen) and new bookmarks and saved pages. The latest version is Opera Mini 4.4 and it should work with your 3110c. To get it go to http://m.opera.com with your phone’s built in browser and click the download link. I tried the bookmarklet but all it seems to do is refresh the page. What’s ir supposed to do? More codes here http://www.javaspell.wapka.mobi/site_opera.xhtml there are other codes like add bookmark, history, settings, opera sync sign-up and sign-out. Read them at the address given above.. In addition to Dennis’s debug: I have host s28-04 … This probably looks like s28-40.opera-mini.net …u’ve got to do the reverse ip search 4 this.. Your site including the page you linked to is password protected and not viewable. Appreciation for this ionrfmation is over 9000thank you! opera is the best browser otherwise. i have surfed around a lot, no output so far. help me sir, i wil be thankfull. That’s something only Opera can fix. In your bug report and forum post be sure to include the make and model of your phone and a concise description of exactly what doesn’t work when you use the QWERTY keyboard to do inline mode editing. how about to change the current site icons in the menu screen? I mean the site which you will going to add as a starters in 1st page.. i just want to delete and change a new ones.. any0ne kn0ws? On touch phones do a long press on the Speed Dial you want to change and choose Edit from the menu that appears. On non touch phones highlight the Speed Dial you want to change and either press the “1” key or do a long press on the center Dpad button and choose Edit from the menu that appears. be very careful with server:source especially when your on version 5 winmo (or generally devices thst have very small amount of resources like nokia s40) because opera faking monospace typefaces by inserting about 2px blank space and sets ’em as nobreaking space so rendering such a page consumes resources (on mine winmo 5% cpu usage even peaking at 100%!).. you can access local files by typing files://your-dir/your-file but make sure your-dir lives in opera directory! What do you mean by “opera directory” ? Get opera mini ‘secret code and get d secret cold off you! Its great that your doing this, to find about certain secrets in opera mini. Keep it up & keep on investigating. We already know now that there’s a new function in Opera Mini 4.3 and 6 which is share, the current function of it is to share a link, I’m going to share my discovery. You will now be prompt to post your status via Opera Mini. 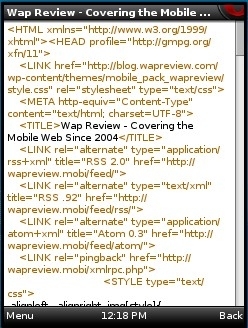 All the special URLs works in OM 4.3 as well (Java version in my Nokia N95). But not in OM 5 and 6 (Any version or platform). Incidentally I have also written a post on this topic some time back at DiGi-PASSION OPERA MINI 4 SECRET URLs/CODES”. I have written all the codes you described (and many more) except the server:source and server:refresh. Thanks for adding these to my knowledge. Good post. One thing I’ve noticed is that none of o: codes work any more for me in Opera Mini 6 and only o:A and o:Z work with Opera Mini 4.3. The others either return “Error reading from server” or a blank screen in the Java versions of 4.3 and 6 and the Android version of 6. Do all the codes you listed still work for you and on which platforms?